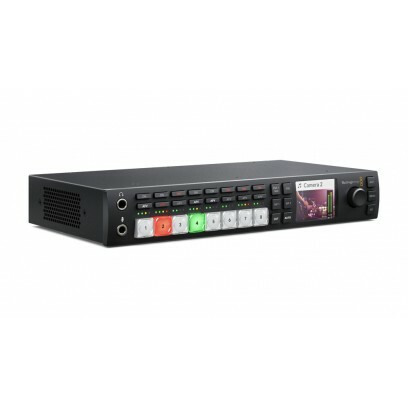 ATEM Television Studio HD is a broadcast quality live production switcher designed for both broadcast and professional AV users. ATEM Television Studio HD features 8 inputs, multi view, aux, and program outputs, analog audio inputs, built in talkback, two flash based media players, incredible creative transitions, a DVE for effects and more. Available to ship: Within 4 business days. *Do you need a power cable? The world’s first live production switcher for broadcast, professional and AV users! ATEM Television Studio HD is the first live production switcher designed for both broadcasters and AV professionals. It includes 4 SDI and 4 HDMI inputs so you can connect up to 8 sources, and it supports all formats up to 1080p60! Packed with high end broadcast features, ATEM Television Studio HD has re-sync on all inputs so you always get clean switching whether you’re using professional or consumer cameras. Plus, you get multi view output so you can see all of your sources, preview and program on a single screen, aux out, built in talkback, 2 still stores, an audio mixer, camera control unit and more! ATEM Television Studio HD is perfect for live production, episodic television, web shows, AV or even live coverage of video gaming competitions! Simply plug in your cameras, game consoles or computers and start switching live! Turn any live event into a professional HD television program! ATEM Television Studio HD is the fastest and most affordable way to create incredible HD programs immediately from live events! It’s perfect for broadcasters, professional sports, concerts, seminars, or even the new emerging generation of web broadcasters using platforms such as YouTube Live, Facebook Live and Twitch.tv. You can switch between multiple cameras, game consoles and computers in real time, all with broadcast quality transitions, graphics and effects! ATEM Television Studio HD features clean professional switching so there’s never a glitch when changing sources. That means you can even use it as a front end controller for your AV system and switch between multiple sources with the press of a button! The world’s smallest all in one broadcast switcher! Operate all switcher features directly from the front panel! Connect up to 8 cameras, game consoles or computers! & so much more! 4 x 3G-SDI and 4 x HDMI inputs for a total of 8 inputs, all with auto re‑sync. Supports all video formats from SD to 720p, 1080i and 1080p HD up to 60fps. 1 x built in multi view for 8 sources, as well as preview and program. Built in media pool graphics storage for 20 RGBA stills. Built in DVE with 3D borders and drop shadow. Transitions include cut, mix, dip, SMPTE wipes and more. 1 upstream keyer including chroma keyer plus 2 downstream keyers. 1 auxiliary output with front panel aux switching buttons and LCD screen for viewing. Balanced XLR stereo analog audio inputs . Internal sources include black, color bars, two color generators and 2 media player outputs. Ethernet connection for computer connection. Mac and Windows control panel software included. Compact ⅔ rack unit size is perfect for when in a portable solution is required. Desktop or rack mountable using the optional Teranex Mini Rack Shelf.